"The Amazing Spider-Man 2" may be about a web-slinging mutant on Earth, but that doesn't mean there are a few great moments for space fans too. Image uploaded May 1, 2014. "The Amazing Spider-Man 2" may be about a web-slinging mutant on Earth, but that doesn't mean there aren't a few great moments in the movie for space fans, too. 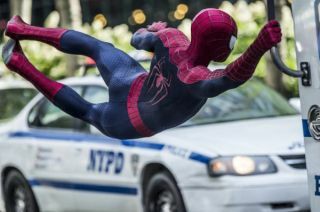 Set for nationwide release Friday (May 2), "The Amazing Spider-Man 2" follows the continuing saga of Peter Parker (played by Andrew Garfield) and his life as Spider-Man, one of the most beloved comic-book heroes of all time. There appear to be two spacesuits in the background of a couple of scenes that take place in Harry Osborn's office at Oscorp. While the two suits only make a brief appearance in the film, they actually come with an interesting backstory: Norman Osborn, Harry's father, helped build the spacesuits when he was younger, before he started Oscorp. "I was an astronaut for Halloween last year," said Marc Webb, the director of "The Amazing Spider-Man 2." "There was a background in terms of Oscorp. Norman had worked on some of the suits as a young man. That was one of the stories we told ourselves." Harry Osborn's home is also stocked with space treasures. For example, the Osborns proudly display the Copernican model of the solar system — in which the planets orbit the sun — mounted high on a wall in the sitting room. Nicolaus Copernicus was the first person to come up with the idea that the Earth revolves around the sun. Until Copernicus came along, scientists thought the sun orbited the Earth. Later, Galileo Galilei contributed to the work Copernicus began, helping to do away with the geocentric view of the universe. The Apollo 12 Commander examines the unmanned Surveyor III spacecraft during the second extravehicular activity in 1969. During a scene in the new film, Peter Parker is walking through the halls of Oscorp and appears to pass one of the most famous Apollo-era photos ever taken. As Parker walks down the corridor, he passes a photo taken during NASA's Apollo 12 mission to the moon, further adding to the idea that Norman Osborn was somehow involved in the space program early in his career. The famous image shows astronaut Pete Conrad and the Surveyor 3 spacecraft in the same frame. The Apollo 12 astronauts brought pieces of Surveyor 3 — including the robot's television camera and other pieces of gear — back to Earth.